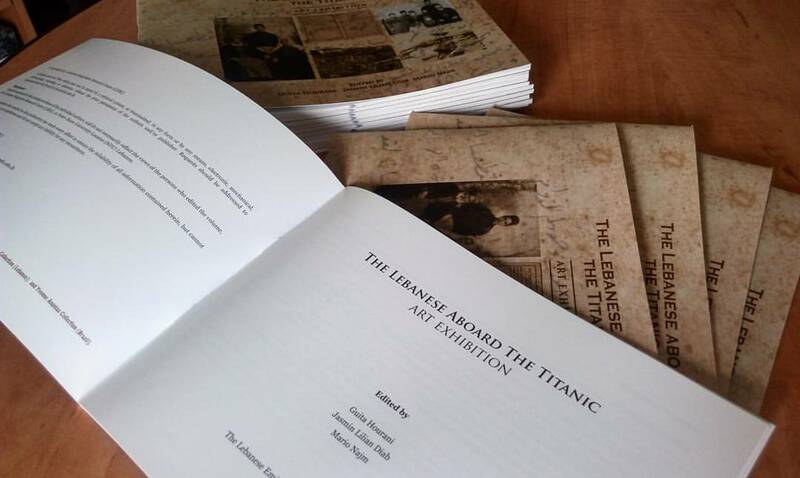 This May, 2017, I, along with co-editors Dr. Guita Hourani and Mr. Mario Najm, published the first ever art catalogue on the Lebanese aboard the Titanic. The catalogue featured a brief look into the politics and history of Lebanese migration, the history and context of the ship itself, as well as testimonies from relatives of those who perished on the great ship. The catalogue then went on to feature a 26-piece art exhibit honouring the Lebanese aboard the great ship. The Lebanese Emigration Research Center (LERC) at the Faculty of Law and Political Science (FLPS), Notre Dame University-Louaize (NDU), the World Lebanese Cultural Union (WLCU) of British Columbia Council, and the Irish-Lebanese Cultural Foundation (ILCF) formed the “International Lebanese Titanic Committee (ILTC)” in 2012, the year marking the centennial of the Titanic’s tragic sinking. The committee was established to identify, commemorate, and pay tribute to the Lebanese aboard the Titanic, as well as work on revealing their names and stories. The current ILTC committee members, as of 2016, are the following: Dr. Nick Kahwaji, DDS representing the WLCU BC Council; Guy Younes, Chairman of ILCF, Ireland; Dr. Guita Hourani, Director of LERC, Lebanon; Carla Zarifeh, representing the Lebanese Canadian Society of British Columbia (LCSBC), Canada; Dr. Josyann Abisaab‏, M.D., USA; Raed Charafeddine, first Vice-Governor of the Banque du Liban (BDL), Lebanon; and Sid Chedrawi, Founder Lebanese-Canadian Chamber of Commerce, Nova Scotia, Canada. Artist Bernard Renno, owner of Vestiges D’Orient, led the call and was able to engage 26 artists from Lebanon to participate. The paintings were exhibited during the Lebanese Diaspora Energy Conference (LDE) organised by the Ministry of Foreign Affairs and Emigrants on 5 and 6 May, 2016, at the Hilton Grand Habtour Hotel in Beirut. Following this exhibition, the artists donated the paintings to the LMM at NDU, except for one which was selected by H.E. Minister Gebran Bassil to be exhibited at the Emigrant Museum in Batroun. The painters and organisers were honoured by the minister at the closing of the LDE. The Lebanese Emigration Research Center (LERC) at the Faculty of Law and Political Science (FLPS), Notre Dame University-Louaize (NDU), in collaboration with the International Lebanese Titanic Committee (ILTC), Vestiges d’Orient, the World Lebanese Cultural Union-British Columbia (WLCU-BC), and the Irish-Lebanese Cultural Association (ILCA), organised the launch of the catalogue as well as the inauguration of the 27 newly-bequeathed pieces of art on the Lebanese Aboard the Titanic into the Lebanon and Migration Museum (LMM) at NDU on 2 May, 2017. This collection, which is dedicated to the memory of the Lebanese who perished aboard — or survived — the Titanic’s ill-fated voyage, was unveiled at the Ramez G. Chagoury Faculty of Architecture, Art and Design (FAAD) exhibit hall in the presence of the artists, guests, and representatives of the participating organisations. Two families, Abi Saab from Thoum and Azzam from Kfar-Katra, whose ancestors were among those who died 105 years ago when the ship sank, gave touching testimonies. Vice-Governor at Banque du Liban (BDL), Mr. Raed Charafeddine, delivered an exceptional presentation. He recounted his observations during a voyage he took during the official centennial celebration, which retraced the Titanic’s route. Charafeddine discussed the lessons he learned during the journey particularly regarding leadership lessons from this historical incident. Fruitful discussions among artists, activists, historians and art critics at the event shed light upon the fact that art contributes to politics in every area, whether in critical thinking, aesthetic, directing societies, providing peace and order or mostly, in providing an outlet – a matter more than one artist stressed in their conversations with me. Artists have affected societies for centuries without the need to directly express a blunt political statement, but rather through preserving their artistic identity as this blunt statement. Art has been central in informing society about communal, political, social, cultural and economic realities without the texts, without the literature, and without the academic sources. Art resonated. It just does – through one image, one painting, one track, one short film, one poem, one verse, or one exhibit. What we often fail to recognise is that art and politics do not only exist in parallel, but rather that politics is directly proportional to art. Both world views and beauties are human-specific. Both experiences and expressions stem from your centre. Both your political views and artistic preferences constitute your being to the same extent. We wanted to accompany the politics with the art that reflects it this time, with the aim of not only giving the artists the credit they deserve, but also of placing art and politics on one common pedestal. You can purchase your copy of the catalogue from Notre Dame University-Louaize in Lebanon through their website, or through contacting the Lebanese Emigration Research Center at the Faculty of Law and Political Science, here: lerc@ndu.edu.lb.